The contribution of B lymphocytes, which are key players in immunity against infection, is still poorly understood in the context of tuberculosis. Researchers at the Institute of Pharmacology and Structural Biology (IPBS - CNRS/Université Toulouse III - Paul Sabatier) found that B cells modulate tuberculosis-associated inflammation through the production of type I interferon. This study is published in the American Journal of Respiratory and Critical Care Medicine, on November 21 2017. In addition to their well-known function as antibody-producing cells, B lymphocytes exhibit antibody-independent innate functions in immunity to various diseases of infectious or non-infectious nature. In tuberculosis, B cells accumulate in lungs, yet their functional contribution to host response to this infection remains poorly understood. With the aim to investigate the contribution of B cells in tuberculosis beyond antibody production, the researchers investigated the global transcriptomic changes in B cells isolated from Mycobacterium tuberculosis-infected mice. The study revealed these B cells displayed a STAT1-centered signature, suggesting a role for interferons in B cell response to infection. 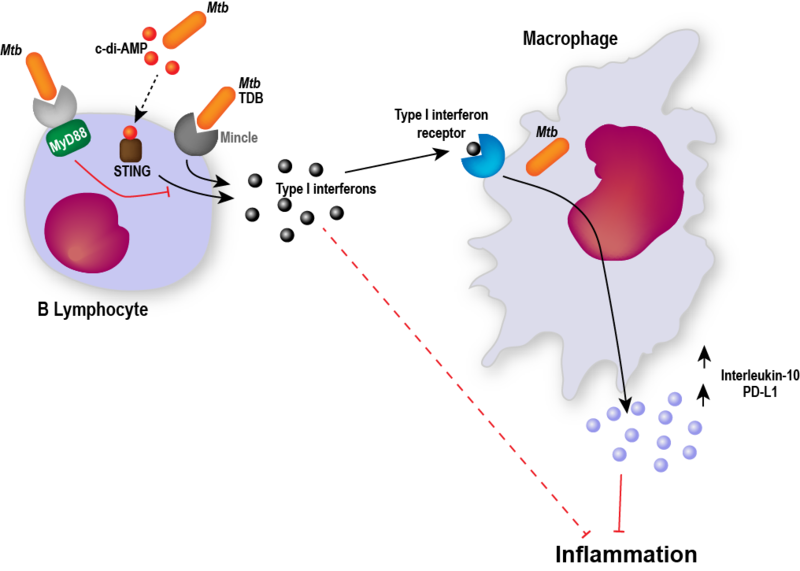 It was found that the in vitro production of type I interferon by B cells involved the innate sensor STING, and was antagonized by MyD88 signaling. Importantly, in vivo experiments confirmed that B cells expressed type I interferon in the lungs of M. tuberculosis-infected mice and, more importantly and of clinical relevance, in pleural fluid from patients with tuberculosis. What is the consequence of this type I interferon expression by B cells? The researchers found that it induced an altered polarization of macrophages towards a regulatory/anti-inflammatory profile in vitro. In vivo, an increased provision of type I interferon by B cells in a murine model of B cell-restricted MyD88-deficiency was associated with an enhanced accumulation of anti-inflammatory macrophages during M. tuberculosis infection. Overall the study identified a novel role for B cells in the immune response to M. tuberculosis, beyond antibody production. This work was performed in collaboration with the group of Dr. Simon Fillatreau (Deutsches Rheuma-Forschungszentrum, Leibniz Institute, Berlin, Germany & Institut Necker-Enfants Malades (INEM), Paris, and other teams in France, Germany, the UK, Argentina and South Africa.